A. It is not the first such order, an Uttar Pradesh MLA, Umlesh Yadav, was disqualified in 2011 on the same ground, of suppressing expenditure incurred in the publication of paid news. B. In a typical inquiry into the paid news phenomenon, the newspaper or publication concerned denies that it was paid for publishing the material and insists that it was part of its normal election coverage. D. The candidate denies authorising the publication and takes the plea that he or she could not possibly account for something that was not paid for. Mr. Mishra was no exception. E. The Election Commission’s order disqualifying Madhya Pradesh Minister Narottam Mishra for three years is an important step in curbing ‘paid news’ in the electoral arena. F. during the campaign for the 2008 Assembly elections, often with his picture and the Bharatiya Janata Party’s symbol. G. The EC has called paid news, a term that refers to propaganda in favour of a candidate masquerading as news reports or articles, a “grave electoral malpractice” on the part of candidates to circumvent expenditure limits. H. He, in fact, argued that his rivals could be behind the 42 reports that the EC’s National Level Committee on Paid News found to be nothing but election advertisements, without any disclaimer. 1. 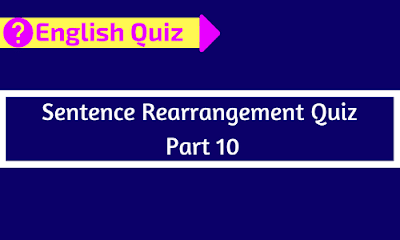 Which of the following should be the seventh sentence after rearrangement? 2. Which of the following should be the fourth sentence after rearrangement? 3. Which of the following should be the sixth sentence after rearrangement? 4. Which of the following should be the second sentence after rearrangement? 5. Which of the following should be the last sentence after rearrangement? 6. Which of the following should be the first sentence after rearrangement? 7. Which of the following should be the fifth sentence after rearrangement? First of all when we solve a parajumble we need to go through all of the given sentences once and when we have done it we can easily find that sentence (1st sentence) in which the main theme has given of the passage in this paragraph we have two sentences that can be our 1st sentence (E or G) but sentence E has the full form of EC so it should be our first sentence. In sentence E it has given that EC has passed an order to disqualify MP’s Minister Narottam Mishra and in sentence A it has given that it is the first order so it can be our second sentence easily. Now we should find those sentences that can be a pair and we can find two pairs easily in this paragraph (D and H), (C and F). In our first pair we have Mr. Mishra a noun in sentence D and in sentence H we have a pronoun he so it can be a pair easily. In our second pair we have a word however that is mostly use in a conclusion sentence and in sentence F we have the other part of sentence C so it should be our last pair. Now we have remained only one sentence (B) and one single place for this sentence place 4th so it can be our 4th sentence.